Our Abpromise guarantee covers the use of ab6734 in the following tested applications. Immunohistochemistry (Formalin/PFA-fixed paraffin-embedded sections) - Rabbit Anti-Rat IgG H&L (HRP) (ab6734)This image is courtesy of an anonymous Abreview. ab25377 staining Ly6g in mouse placenta tissue sections by Immunohistochemistry (IHC-P - paraformaldehyde-fixed, paraffin-embedded sections). Tissue was fixed with formaldehyde and blocked with 5% BSA for 30 minutes at 25°C. Samples were incubated with primary antibody (1/100 in PBS/1% BSA) for 12 hours at 4°C. A HRP-conjugated rabbit anti-rat IgG H&L (ab6734) (1/200) was used as the secondary antibody. Ab6734 was used at dilution 1/5000 with the primary antibody ab33731 in WB. See the review on ab33731. Immunohistochemistry (Frozen sections) - Rabbit Anti-Rat IgG H&L (HRP) (ab6734)This image is courtesy of an anonymous Abreview. ab6326 staining BrdU in mouse small intestine tissue sections by Immunohistochemistry (IHC-Fr - frozen sections). Tissue was fixed with acetone and blocked with protein blocking solution for 1 hour at room temperature. Samples were incubated with primary antibody (1/100) in Ab diluent for 1 hour. A HRP-conjugated rabbit anti-rat IgG H&L (ab6734) (1/500) was used as the secondary antibody. IHC image of alpha tubulin staining in human colon formalin fixed paraffin embedded tissue section*. The section was pre-treated using pressure cooker heat mediated antigen retrieval with sodium citrate buffer (pH6) for 30mins. The section was incubated with ab64332, 5µg/ml overnight at +4°C. An HRP-conjugated secondary (ab6734, 1/500 dilution) was used for 1hr at room temperature. The section was counterstained with haematoxylin and mounted with DPX. worked good for DAB staining in placenta for neutrophils at 1:200 dilution for 1 hrs. Detection of E-cadherin in mouse ES cell whole cell lysates. Secondary antibody worked very well. Clear bands seen. Other marks on film are pen marks only. Having reviewed the protocol details, I would like to clarifya few points.The primaryantibody used to detectUCP1 israised in rabbit. It is arabbit polyclonalantibody.In order to detect this efficiently, an anti-rabbit antibodywould need to be used.The antibody ab6734 is ananti-rat antibodywhich is unlikely tobe able to detect therabbit IgG of ab10983.I would suggest using an antibody such ashttps://www.abcam.com/Goat-polyclonal-Secondary-Antibody-to-Rabbit-IgG-H-L-HRP-ab97051.html.Was the antibody ab6734 used with any Rat primary antibodies with difficulty? Thank you for your cooperation and look forward to your reply. Salve, mi sono arrivati due vostri anticorpi ordinati da SIAL (SIALN°ordine 37 del 05/04/12AB4566 anti fibrillarin eAB6734 rabbit polyclonal) rosati invece che trasparenti come al solito (li ho confrontati direttamente con gli stock che avevo non completamente esauriti). E' normale? I due anticorpi sono arrivati con i panetti di ghiaccio insieme al deoxycolato di sodio. I would like to reassure you that these products are safe to use. The anti-Fibrillarin antibody [38F3] is a tissue culture supernatant and is not purified. Other proteins will be within the solution and this can give it an off white colour. The secondary antibody is conjugated to HRP which can also be coloured due to the HRP conjugate. This is likely to be unconjugated HRP that has not been removed. There will be batch to batch variation with both products and this may be why you have not observed this before. We ship the majority of our products with an ice pack during shipment to maintain a temperature of ˜4C. However if this is not suitable for the product we will ship on either dry ice or at room temperature. Please continue to use these products as advised and if you do experience any problems please do not hesitate to contact us. You will be covered by our Abpromise guarantee so if the products do not perform as described you will be eligible for a full refund/replacement. Thank you for your enquiry. I have received a reply from the originator of ab6734 and ab7104. For both products, there are approximately two HRPs per antibody. The method we use for our HRP conjugation is proprietary. ab6734 is only tested against rat IgG and cross reactivity is possible, especially with species that are similar such as mouse and other small animals. 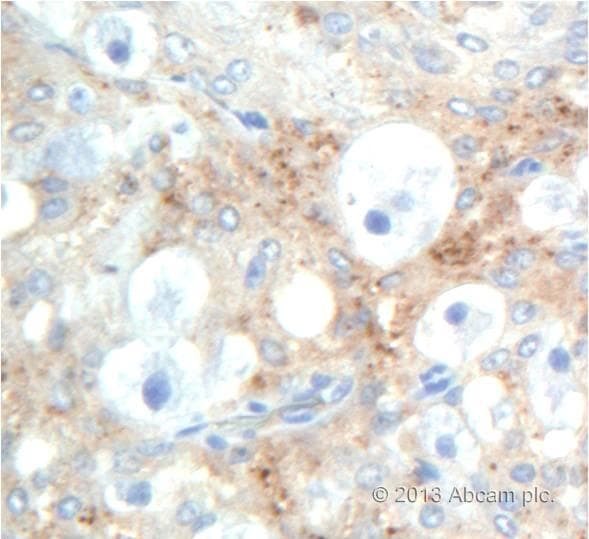 Product ab7104 is preadsorbed against human serum proteins and shows no cross reactivity with human serum proteins. However, this may cross react with similar species as well as this has not been tested. Lastly, the concentrations listed on the data sheet are the concentration of the HRP conjugated antibody. I hope this information helps. Please don't hesitate to contact us again if you have further questions. Thanks for your response. So what is this integral membrane protein? Actually, the band I am getting is close to 25 kDa. So this is not TNF-alpha? Please tell me more about this integral membrane protein. I thought it is TNF-alpha because it is really a very clean band. Please advise me what dilution I need to use for the primary TNFantibody(ab11564) and secondary rabbit polyclonal to rat(ab6734).If you have a protocol please send me a copy. Thanks. Thank you for your email. Our source for this antibody tested ab11564 in Western blotting with recombinant TNF alpha. Conditions were standard. 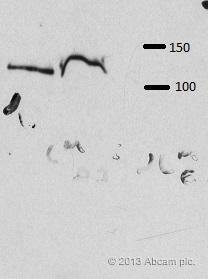 To use this antibody in Western blotting, I would recommend referring to our general Western blot protocol which can be found in the protocol section of the online datasheet. I would suggest using ab11564 at a 1:1000 dilution, and ab6734 at a 1:5000 dilution. I conferred with our source for ab11564 and it sounds like you are detecting the membrane bound form of TNF alpha (the 26 kDa integral membrane protein). If you have any additional questions, please contact us again.